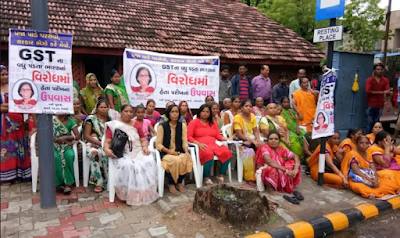 Gujarat farmer leaders detained off Gandhi Ashram for holding footmarch to Gandhinagar "without permission"
Gujarat police on Friday detained two senior farmers’ leaders, Sagar Rabari of the Khedut Samaj Gujarat (KSG) and Alpesh Thakor of the OBC Ekta Manch, along with some of their colleagues soon after they began a 25-km farmers’ footmarch from Gandhi Ashram in Ahmedabad to Gandhinagar, the state capital. They were demanding farm loan waiver. The footmarch, which began at Khet Bhavan near Gandhi Ashram, first went to the Gandhi Ashram, where farmers garlanded the statue of Mahatma Gandhi. However, no sooner they moved out of the Gandhi Ashram and proceeded towards Gandhinagar, they were stopped by the cops standing off the Ahmedabad district collector’s office. On Wednesday, police detained hundreds of farmer-activists across Gujarat after they poured thousands of litres of milk on roads, demanding a waiver of all farmer loans in the state, where essential commodities have seen a sudden spurt in prices. Led by Alpesh Thakor, the agitation was dubbed “Doodhbandi” and “Doodh Roko”. Thakore also heads Kshatriya Thakor Sena. 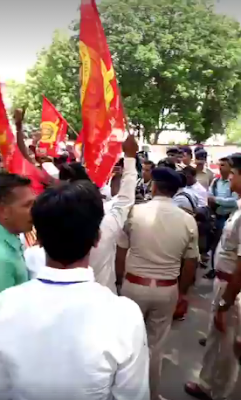 Thakore and 50 supporters were detained in Ahmedabad after his group blocked roads and poured hundreds of litres of milk on the Sarkhej-Gandhinagar Highway, which connects Ahmedabad with the state capital. The agitation was simultaneously held some several other towns.